Three quick things, none of which is fiber or textile related. The first is in response to an interest in how I created my blog index (in the sidebar) using Delicious.com. For those who are interested, I'll do a post giving a "how to" later in the week. 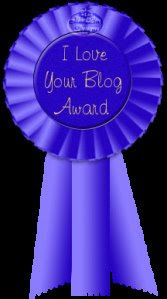 Awarded to me by both Laritza and Neki Desu. I confess that awards make me feel a little awkward, though I am always wonderfully pleased to get them. The fun thing about them is discovering what other blogs everyone reads and enjoys. I've found a number of new blogs this was, as well as made a number of new friends. Devon Fine Fibres - Life on a very special Devon farm - Lesley is an excellent writer and her blog is always interesting to read. Not to mention that she raises rare Bowmont sheep and Cashmere goats. Pioneering on the Home Front - Tracey is working toward a life I would love to live: homesteading, self-sufficiency, gardening, plus crafting. Shuttle Pilot - Jane is a very high energy lady and reading her blog is always motivational. Sheepish Annie - Knitting, spinning, cats, and everyday life with a sense of humor. What more could a reader want? Talking About Weaving - I always try to list blogs for these things that I haven't named before, but Peg's comes back around back to the top of my list pretty quickly. OK. I could go on and on, but I have to leave someone for the above to nominate! You can help me greatly by telling me which version you see, (A or B) and what web browser you're using. Thanks! I see "B" and use Firefox. I actually used your delicious idea for one of my work blogs! I see "B" on Google Chrome. I see B and use Firefox. Thanks so much for nominating me for the award. I'll get my head round what it means and what I need to do tomorrow when I've recovered from the IKNIT show!!! I see Band use Firefox too. Why thank you! I love your blog too, you know! And I see both versions on Safari, but the second one looks to be lined up correctly (B) The first (A) has the tabs sitting in the middle of the header instead of at the bottom. I use Firefox and Konqueror (3.2.1). Both show B correctly, and A with the tags floating up above your blog title. Annie, Valerie, and Dorothy, I'm a little puzzled. When you look at my blog header, you are seeing two sets of tabs? One floating and one at the bottom? I have a Mac, use Safari and occasionally Firefox and I see B on both of the browsers. Congrats on your award! Great blog recommendations. B and I use Explorer. I see B (Firefox). Thank you for the award. Now to do something about it........ Actually, not so much for the award as for what you actually said. That was lovely and thank you. With Firefox I see B. With Internet Explorer (V6,SP2) I see a variation on B -- the tabs are positioned vertically as you show them, but they are completed rectangular (not rounded at the top) and shifted to the left so that the 'Gallery' tab hangs off the left side. Hope this helps. I see B, Firefox 3.0.1 on the Mac. I get view B on IE version 7. And congratulations on your award. I think it is well deserved and overdue. :) But then, I am biased. I've never explored your links, but I think I need to spend a little time going thru them - Now I know what wraps per inch means..ha ha ha... T.
I see A & B also. I use explorer. A has the tabs floating in the middle of the header (only one set of tabs in both A & B) B has them positioned better at the bottom of the header and not covering your name! Thank you one and all! I realized that I wasn't very clear in my request, but with your help, I'm much relieved that my blog header looks at least approximately the way I hoped! Good morning, Leigh. Thank you for your kind words and for passing along the award. You made my day! I use both IE and Firefox and see "B" with both. I like Version B and use Firefox. Amy tells me that's a big different in the views between Firefox and IE.